When customers abandon a shopping cart, their customer journey isn’t over — and your relationship with them has just begun. Your next move is critical. In-the-moment data is crucial for driving highly targeted digital experiences that drive conversions, reduce abandonment and build loyalty. Find out how to optimize end-to-end customer experiences across entire campaigns for greater ROI. 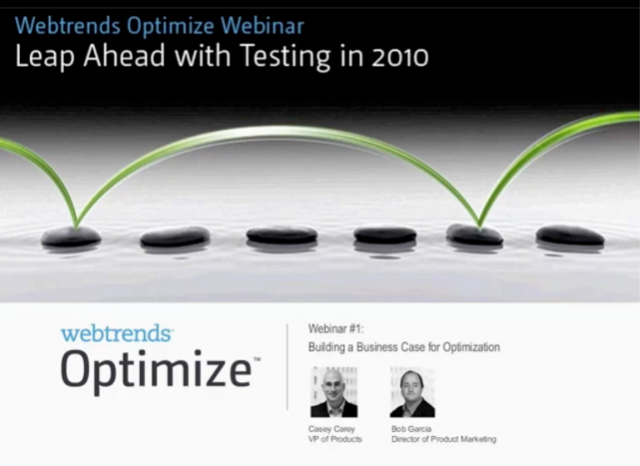 Webtrends has just released a new version of Optimize with a full range of new features. Join us for this 45-minute webinar to see the updates first-hand. In today’s world, your consumers are connected to everything, everywhere, all the time. Because of this, you can gain insights about who they are and what they want at every touch point, across their entire journey with your brand. This can encompass interactions that are worlds apart, including search, social, offline interactions, behaviors on your site, and everything in between. So how do you draw together these hugely informative yet disparate data points to drive relevance for your customers, every time they connect with you? The answers are surprisingly not so different from organization to organization. The average conversion rate for a marketing campaign is 3%. And even though this may be “industry standard,” it doesn’t mean it’s good. A 3% conversion rate means you are effectively losing 97% of the audience you have invested in acquiring. Join us as Marketing Sherpa presents key findings from their Landing Page Optimization Benchmark Report. We’ll also provide real-world examples of how organizations have increased revenue by testing to lift conversion rates, and how going beyond a 3% conversion rate is possible for everyone. Savvy e-commerce marketers know that if you're not testing your web site, you're leaving money on the table. Likewise, if you’ve started testing – but got stalled in a world of one-off tests – you're not realizing the revenue you could be. Retailers who want a bigger piece of the online revenue pie must establish a comprehensive testing strategy or be left behind. This strategic approach enables retailers to capitalize on the growing ecommerce market – predicted by Forrester to be $327 billion by 2016 – and positions them to compete with the biggest names in online retail. Join Jason Miller, CTO of Motorcycle Superstore, and a Webtrends optimization expert as they discuss real-life experiences with ramping up testing and how to create success. He also reveals how Webtrends helped Motorcycle Superstore uncover $2.5 million in incremental revenue through a strategic testing program. With marketers investing more money than ever in digital initiatives that span multiple channels (search, display, video, social, etc. ), the digital marketing ecosystem has become increasingly more complex. This additional investment means being able to understand the performance of your campaigns across various channels is that much more important. To truly understand how well a campaign is doing requires thoughtful planning, solid processes, integration of multiple data sources, and automation of reporting into meaningful visualization. Interest in site optimization is at an all-time high, and it’s not hard to see why: in an increasingly complex ecosystem of digital touch points, online testing is a highly effective tool for ensuring that customer experiences and marketing efforts will resonate with visitors. Interest in site optimization is at an all-time high, and it’s not hard to see why. In an increasingly complex ecosystem of digital touch points, online testing proves to be a highly effective tool for creating customer experiences that resonate with visitors. The problem for many companies is how to start an optimization program. Site optimization doesn't have to be overwhelming. An online testing program isn't just about buying the latest technology. The path to success also includes a long-term, continuous strategy that incorporates culture, processes and organization. This webinar shows you how it's done. Marketers are under great pressure to move beyond creative thinking and become more results-driven. Join Sr. Product Marketing Manager Jennifer Wilson to learn about how you can increase your revenue and website conversions by developing relevant content and offers that are essential to generating leads, increasing conversions, and driving sales. Learn how you can understand online behavior so you can effectively target your site visitors. The emergence of website optimization has enormous upside for both companies and site visitors. Site optimization is not a one-time event or placing search engine terms in copy. It is an ongoing process that helps drive conversions and revenue. It is not based on guesswork or opinion, but on data of actual visitor activity, preference and behavior. This data, derived from a process of testing and targeting, fuels the optimization process, leading to better results and value, including personalization of customer engagement. In this session, you will learn the critical components to website optimization that will help grow your business. For marketers and web designers who want to provide the best online experience for their customer and prospects. Drive revenue, lift, and conversions online through testing and targeting.